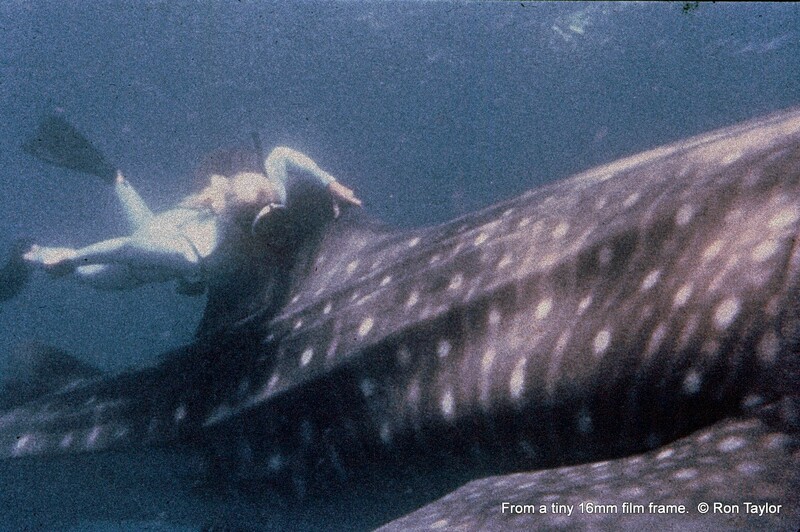 Valerie Taylor along the first and largest whale shark she has ever seen. Valerie and the whale shark. We were on a job to film seals (sea lion) at the big rock. 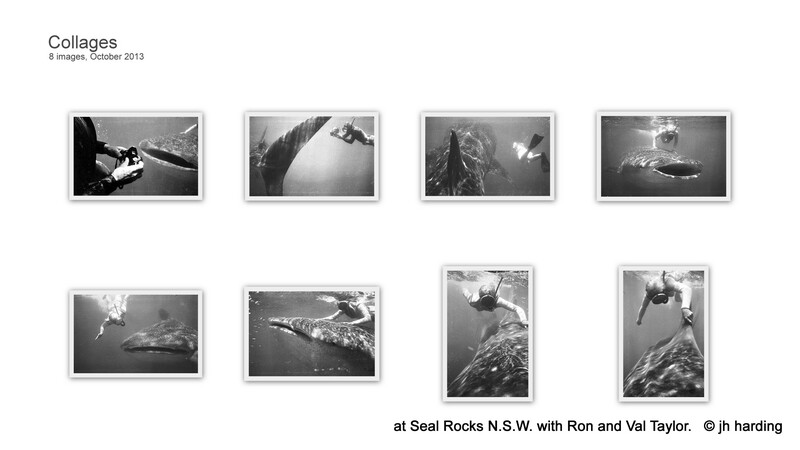 My camera gear was a Nikonos with 28mm lens and a roll of black and white (36 exposures). Ron had two rolls of 16mm film (200 feet in total) plus a Nikonos with 35mm lens and a roll of 20 exposures color film. We encountered the whale shark by chance. 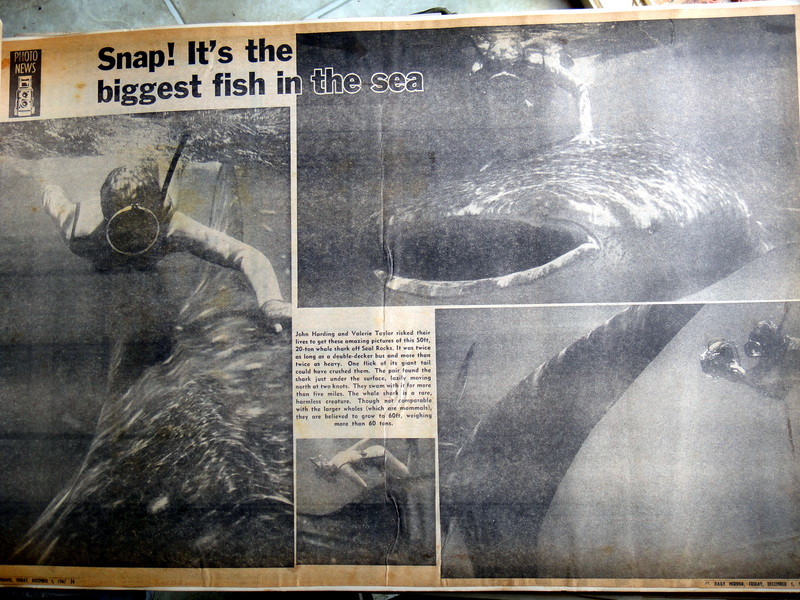 It was in our path between Sugarloaf Point and our destinaton – and swimming slowly in a southerly direction. The three of us slid overboard and let Ron’s 14 foot boat drift. 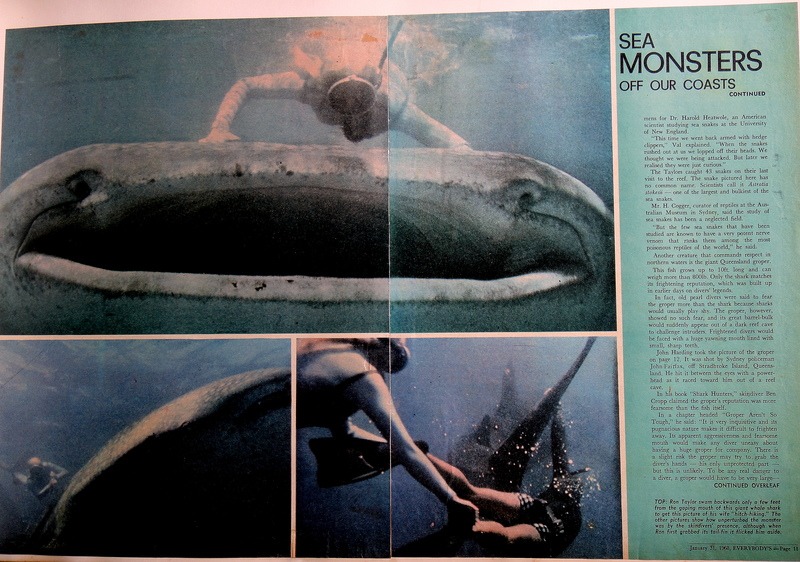 After swimming for maybe one hundred yards, we’d return to the boat, catch up with the whale shark and repeat the moves. On the second dive I touched the whale shark’s tail. Instantly it did a crash dive, swimming vertically out of sight in to the depths. Minutes later it was back on the surface continuing the southerly journey toward Broughton Island. By the third or fourth swim we were almost out of film. Ron had just enough left for a final scene with his movie camera. I devised the plan where we’d get ahead of the whale shark then I would dive in first and hold onto the tail while Valerie would attempt to grab my ankles ten seconds later when the shark and I were nearer to her up ahead. It worked. The color still has been lifted from 16mm. It was a key sequence later in the opening titles of “Innerspace” a 13 episode TV series featuring The Taylor’s. 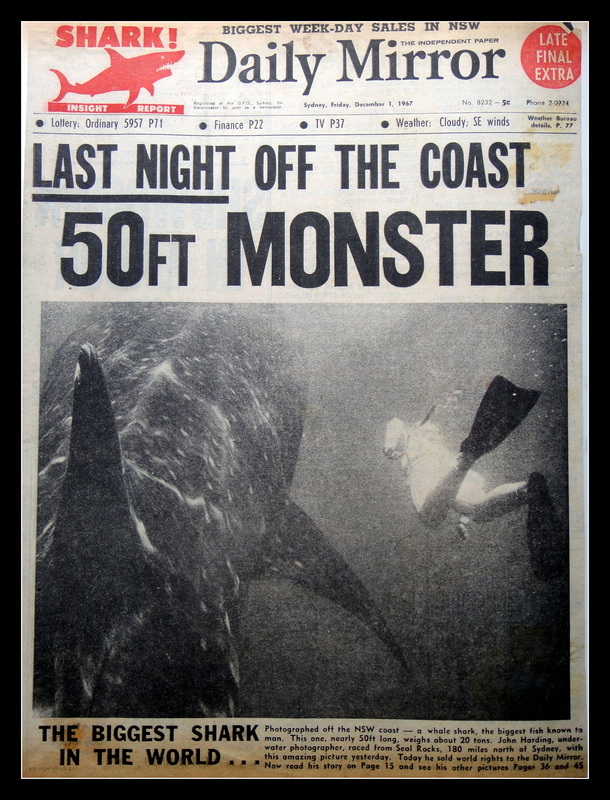 My black and white stills (mostly exposed at f22, 1/125th for best depth of field) coincided with the last day, of a week-long shark series by Sydney’s leading evening tabloid The Daily Mirror newspaper. As well as the front page there were four inside pages of pictures and text and good credits and a nice payment negotiated. Ron gets some shots with his 16mm hand-wind Bolex in custom housing of his own design. One hundred feet of film lasts 2 minutes 44 seconds and is very expensive today. The same camera used to make several of his first documentaries. Ron used Kodachrome for many years which has the advantage of not fading in the future.